Throughout the nineteenth century topographical images in periodicals, books, and later posters and postcards, continued to document the landscape both “Home” and “Abroad” but the technology for doing so changed rapidly too, as the following pairs of Fisher's steel engravings alongside photographs by Priestley & Co.from the end of century demonstrate. Henry Fisher was one of the foremost publishers of topographical engravings of his period. By 1835 his firm was advertising five lavishly illustrated volumes of "Views", covering India and the Far East, as well as regions of Britain, some of which were available in French and German editions. 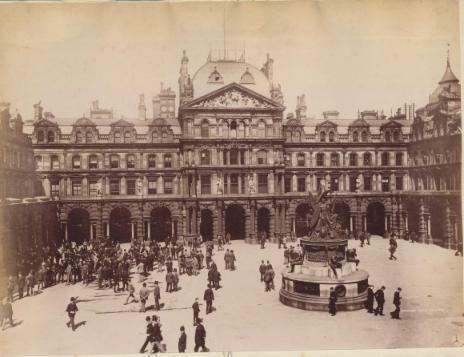 He had also established the annual Fisher's Drawing-Room Scrap Book. 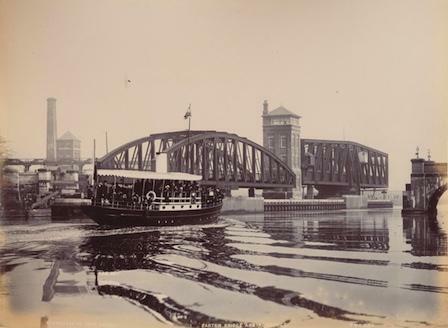 Samuel Priestley, born in the 1820s, had started out as a photographer in the mid fifties, then with his son Arthur established a photographic studio in Wallasey 1885. Although Priestley's photographic legacy (see Editor's Jottings for more information) includes images of distant countries his firm concentrated on Lancashire people and places.The images here are taken from Merseyside in Monochrome by kind permission of the author, Michael G. Priestley. Nelson's Monument is here the focus of attention in the view of the Exchange Buildings in Liverpool as visitors, including elegantly attired ladies, admire it. It was designed by the then youthful Matthew Cotes Wyatt, cast by Richard Westmacott, and unveiled in October 1813, on the eighth anniversary of Nelson's death. Fisher's letterpress gives an earlier date* for the monument's erection. Of the statue the writer concludes "Situated as this Monument is, in the very centre of business, of the second commercial town in the kingdom, it must force itself on the notice of all foreigners, and tend to impress upon them a conviction of the stability of that Naval Empire which Britain has so long, and by such transcendent exertions, been able to retain." 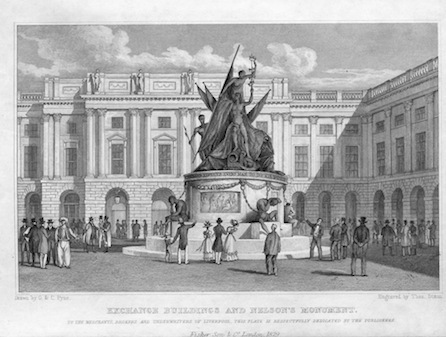 Nevertheless, the description of the "allegorical representations" within the bronze memorial, erected in 1812* by public subscription "at an expense of £9000", also recorded contemporary attacks on the design. The depiction of Nelson's victory, symbolised by the fourth wreath,"his last trophy ... while, at the same instant of triumph, Death, represented by a skeleton lying concealed under the enemy's flag, with too fatal certainty reaches his heart ... has been much and severely criticized.....The four captives in chains, at the foot of the pedestal, are also, it is asserted, a very unfair emblem of the usages of modern warfare, and seem to indicate a ferocity totally inconsistent with the well-known generous temper of Nelson." 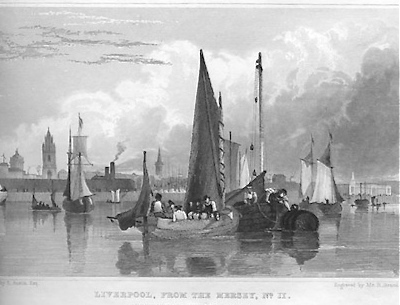 This engraving from Lancashire Illustrated "Liverpool from the Mersey" has in the background some of the port's distinctive buildings. It is the second of four views (dated 1829) under this title, and subtitled "Commencing at the Prince's Dock". The foundation stone of this Dock had been laid in 1815 and the Dock opened on the day of the coronation of that Prince as George IV, July 19th, 1821. We are told in the accompanying text that between the wall enclosing this Dock and the river was a "spacious terrace" from which at high tide the public could enjoy an "exceedingly interesting" view embracing "not only the scenery on the opposite shore, but fleets of vessels of all dimensions, amounting sometimes to two or three hundred in number." 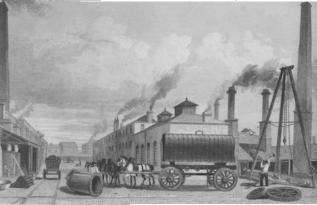 The building from which the smoke emerges was the Steam-engine house for grinding the lime used in the construction of the Docks, and also to work two cranes fixed some distance away. By the time the engraving appeared in the Views however that "whole edifice" had been removed. In the background, almost centre-plate, is the spire of St.George's Church. 1895 was the year in which the Mersey Docks and Harbour Board opened Liverpool Riverside, a new passenger railway station adjacent to the Princes Landing Stage, which provided direct access to a train service for travellers from trans-Atlantic liners; a move designed to counteract the Dock’s loss of trade to the port of Southampton, where railway stations were located close to the berths. 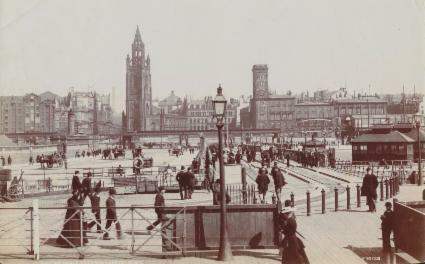 The first landing stage completed in 1847 was 508 feet long and 82 feet wide. A decade later the Prince’s Stage was added. 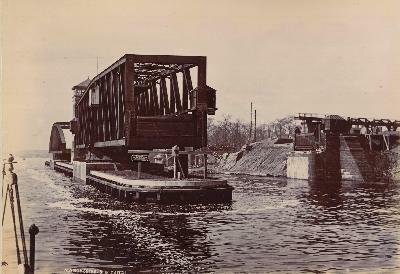 One of the series of Priestley photographs of the Manchester Ship Canal* from Mike Priestley's book Merseyside in Monochrome. See Editor's Jottings for information on purchasing this and his other books. * All the photographs from the Priestley collection are reproduced in smaller format by kind permission of Mike Priestley. © Barbara Onslow 2007 This page initiated April 3rd 2013, developed from October 18th 2013.